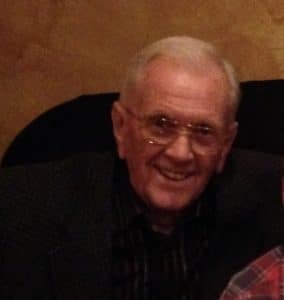 Clyde H. Baker DC, age 89 of Bridgeville, passed away peacefully on November 18, 2018. He was the beloved husband of Virginia Baker for over 66 years; loving father of Cindy (Vince) Lamberti, Lee (Tom) Hokaj, Jane (Brian) Andruscik, the late Lynn (Gary) Fritz, Scott Baker, and Clarke Baker; Father In Law to Starlet Baker; cherished grandfather of James (Sarah) Fritz, Emily Fritz, Megan (Brandon) May, Jennifer (Rafael) Corredor, Adam (Jolynna) Hokaj, Alyssa (James) Padula, Michael Lamberti, Luke Andruscik, and Kellen Andruscik; great grandfather of Caitlyn and Logan Fritz, Lilly and Emmalynn May and Malia Padula. Clyde was a graduate from Logan Chiropractor College and Duquesne University. He practiced Chiropractic for 35 years. He had a deep love for many different kinds of music but had a passion for playing the steel guitar. At one time he worked with the Youth Ministries at Hope Lutheran church, and was a faithful member at South Hills Bible Chapel where he was a member of the radio ministry on Word FM for South Hills Bible Chapel. He enjoyed traveling and photography but most of all he enjoyed spending time with his family. He will be deeply missed by all who knew and loved him. Family and friends are welcome Saturday, December 1, 2018 from 10 am until the time of a Memorial Service at 11 am at The Bible Chapel, 300 Gallery Road, McMurray, PA 15317. In lieu of flowers, memorial contributions may be made to the Alzheimer’s Foundation at www.alzfdn.org. Jane, Brian and family - I’m so sorry for your loss. My prayers are with you all. Dr Baker you will truly be missed. To my 2nd family, I am so sorry for your loss. All my love to you all. Sending prayers and healing thoughts to your family. I have fond memories of that steel guitar. Loving memories of times spent together with The Chapel Heirs and God's Country. My love and sympathy to your entire gifted family. I'm thankful for the years I had the privilege of sharing music with your Dad in the Chapel Heirs Gospel Group, as well as God's Country.